Looking forward to the end of midterms? 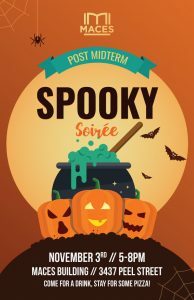 Join MACES for a Post-Midterm Spoooooky Soirée! November 3rd, 5-8pm in the MACES lounge at 3437 Peel Street. Come for a drink and stay for some pizza! It’s FREE!